No one likes doing the tedious stuff when you get back from a fishing trip or from taking the boat out for a lazy Sunday. Who wants to deal with fishing rods, beer coolers, tackle boxes, or that bag of sunscreen, hats, food, and other essentials? It always feels like there’s more to deal with coming back from the water than getting there. Still, we get it done to keep everything clean, organized, and ready to rock for the next nautical outing. But when was the last time you cleaned your life jackets? 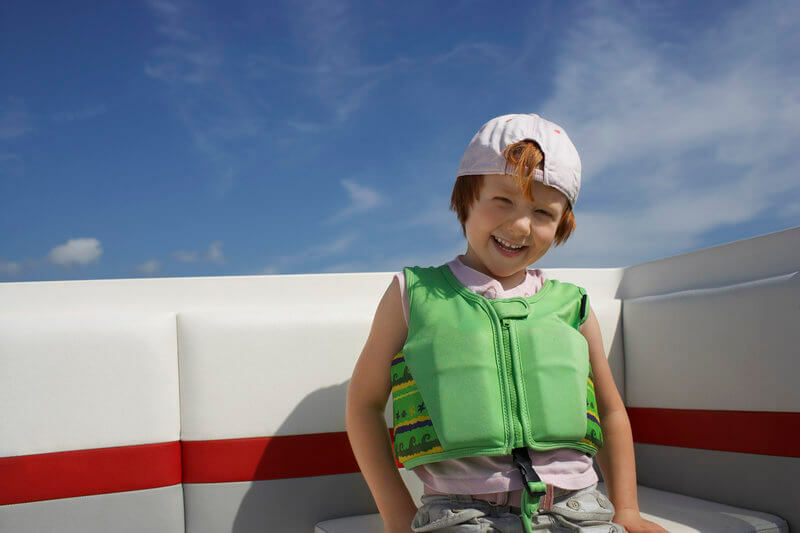 Life jackets are the most important piece of equipment on your boat. They save lives. By keeping them readily available and enforcing their use, you are helping protect everyone aboard your boat. Unfortunately, personal flotation devices are often not given the respect they need on dry land that they receive on the water. Mold and Mildew: These build up when your jackets have been stowed away wet. If they have not been allowed to fully dry, you’ll be dealing with more than a bit of dirt. Dirt and Grime: When you’re outdoors, getting dirty is just a fact. Whether it’s mud, sand, or your child’s melty ice cream sandwich, those life jackets are going to get messy fast. Lotion and Skin Oils: It doesn’t matter if you’ve slathered on the sunblock or tanning lotion, that slick stuff is going to seep into the fabric of your life jackets. Even if you don’t protect your skin from the sun (which should never happen! ), our bodies natural oils and sweat will the job of staining your flotation devices just as well. Smells and Scents: Besides the earthy funk from mildew and mold, a variety of smells will end up sticking your life vests over time. Smoke, salt water, beer, perfumes, and fish are just a few of the scents that will start clinging to your jackets if they are not washed. Do you want to wear a dirty, smelly life jacket during a nice day on the water? Neither do your passengers. Here are a few methods to keep your personal flotation devices as fresh as a newly scrubbed deck. Scrub the life jacket using a soft bristle brush to remove most mildew, mold, and stains. Continue reading for harder to clean spots. Mix a solution that’s one part hydrogen peroxide (bleach) to two parts water. Once that’s thoroughly mixed, pour it directly on the spots of mold and mildew or heavy stains that are giving you the most trouble. Let that soak in under direct sunlight for about forty-five minutes. Now you brush the life jacket again, scrubbing away at the solution soaked problem areas. Use clean, fresh water to rinse it off afterward. Mix a new solution of water and some dish soap to wash over these areas a third time. After rinsing with clean water again, make sure to hang the life jacket(s) somewhere they will be able to dry completely, preferably in direct sunlight. This is a straightforward option that really just requires time, a strong arm, and an area you don’t mind getting a little wet. Simply get your life jackets, bring them to a spot you can comfortable clean them in, throw down a tarp, and get to work. After mixing up a bucket of soap, water, and some liquid laundry detergent, place all your jackets on the tarp. The tarp is there to protect the fabric of the life jackets but if you have a smooth surface like the floor of your garage, feel free to set them down there. Once you have your bucket of suds it’s really all about giving the life jackets a thorough scrub down. When you’ve gone over one side twice, flip them over onto the backside and brush it down a couple times too. This way, each side is able to soak for about thirty minutes before you turn it back over for another, though quicker, scrub. After each side has been given time to soak and scrubbed down two to four times, rinse them off with clean water to remove any traces of soap. Hang them up to dry – again, preferably in direct sunlight – then place them back in their storage area. Just like that, you’ll have good as new life jackets that anyone would be happy to wear. It never pays to leave something to the last minute. Don’t let smells, mold, and mildew creep up on your before your next trip out to the lake. With these life jacket cleaning methods, you’ll be as clean as you are safe for that next family outing.